When Terry Pratchett wanted to explore how trolls might name themselves, he used mineralogy. Jade was one of the first Pratchett trolls to have a name. It was curiously dignifying as well as amusingly paradoxical (how could a lump of rock have a name, ho ho ho). Pratchett continued to dignify his troll characters rather than just generating cheap laughs, because naming confers identity as well as personality: Bauxite, Beryl, Mica, Flint and the greatest of all, Mr Shine: him Diamond. In N K Jemisin’s The Fifth Season (2015) [update: which won the 2016 Hugo Award for Best Novel] there was a similar geological component in the storytelling that produces dignity rather than jokes. On completing their first phase of training orogenes name themselves for precious and ornamental stones: Alabaster, and Syenite. Their job is to sense and work with the movements of the earth, to quell earthquakes, shape landscapes, create islands and bury cities. Because of their phenomenal destructive capabilities they are hated and feared by people without that power. In that excellent novel we also met stone-eaters, creatures who move through earth and rock, and eat stone, even stone that was once human. When the Fifth Season begins – a period of violent climatic change brought about by catastrophic eruptions and earthquakes – Essun, an orogene who is trying to find her lost daughter, meets Hoa. She assumes by his name that he is the lost small boy he looks like, although the reader has seen him emerge from a stone nodule. But Hoa is not a mineral name. In The Obelisk Gate, as Essun struggles to survive after the apocalypse of The Fifth Season, she encounters other stone-eaters. They attach themselves to orogenes, as disconcerting guardians and bodyguards. They exude danger and power in a way that Pratchett’s trolls could not, though Hoa, for one, does have a sense of humour. Essun’s names for them are not particularly beautiful, or respectful: Ruby Hair, Butter Marble, Ugly Dress, Toothshine, Grey Man. Hoa has different names for them, and Essun does call the sternly imposing Antimony by her name for good reason. But these sloppy nick-names reflect Essun’s state of mind when she meets them: usually exhausted, and enraged at how little she understands of what is going on in her community, and in the world, now that everything is made different. Perhaps it’s the gravity of the situation in The Obelisk Gate that makes the stone-eaters so grim, and so watchful, assembling silently in the plot with a sense of simmering excitement. (Is it food? More of their kind?) The earth has moved in several places, and Essun has learned to summon the obelisks, the gigantic hovering mineral rhomboids in the sky that magnify and amplify her mental earth-moving powers. Alabaster is trying to teach her how to work with them, but he is a terrible teacher, impatient and elliptical, and he is weakening because he is turning into stone. The other orogenes in the underground community of Castrima where Essun is living are only concerned with keeping the people safe and fed, and keeping the life support systems running. But on the surface, where ashfall is preventing crops from growing and killing the trees, other people are coming to find Castrima, and they are not interested in sharing. 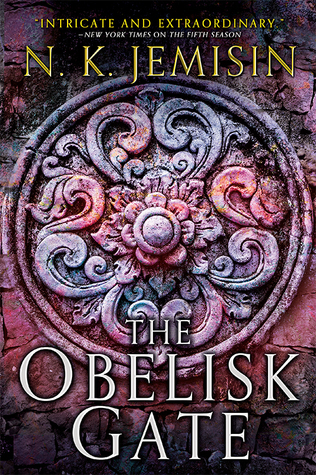 The Obelisk Gate continues to develop Jemisin’s rich and complicated world. There is so much that the reader doesn’t and can’t know, yet the pace of the events drags us past unanswered questions. It’s like riding a white-water raft through plot points and characters. Essun spends the entire novel in Castrima, keeping her community alive, but what she doesn’t know is that several other characters are struggling to survive elsewhere on the continent, and she needs most desperately to find them before truly terrible things happen. Really terrible things happen throughout the novel, at the human scale, but Essun’s focus is planetary now, and the reader’s empathy is switched rapidly between small children and whole land masses. Jemisin’s handling of several strands of narration simultaneously is expert, occasionally with deliberate tangles. As she did in The Fifth Season, in The Obelisk Gate she uses a challenging second-person narration to make us not quite sure who ‘you’ is, and who is saying ‘you’. The multiple narratives tease out the major new development in this novel, a new thing that orogenes can do, which brings magic into the plot, and the series. I was unsure how the integration of sf and fantasy would work, but because Jemisin describes the magical elements in grounded scientific terms, it works for me. What the orogenes do is of course totally fantastical, but by clothing its functionality in words from biology and geology, Jemisin cuts off any possibility of elves and unicorns. We only have the stone angels to contend with instead.